“The Great Flood of 2016” is what they are calling it. Something twists in my gut calling the flood “great”. “The Great Flood of 2016” will prove God is greater. This past week has been one of the most heart wrenching weeks of my life. Countless family and friends had their homes flood here in Louisiana. Most of them do not have flood insurance because they do not live in a flood plain. Many areas that were “never supposed to flood”…flooded. Water was down our street just a third of a mile! Flooding was the last thing I was concerned about…until this past week. I couldn’t sleep because my heart broke for those losing everything. I couldn’t sleep because I was watching the water rise. I couldn’t sleep because I was getting our “Evacuation Kit” prepared. This is something I have wanted to do for a long time… because of Hurricanes though…not floods. A flood was never expected in my neighborhood. But neighbors less than a half a mile from our home now have their lives in piles on the street. The have stacks of sheet rock and carpet torn out of their house piled up next to their lives. I am trying to do what I can from home to help but feeling “stuck” at home with our 1 year old is hard. My husband has been serving non stop. In the beginning he was rescuing people from houses. Now he is gutting his parent’s house and also neighbor’s houses. We are “one” right? So, he is an extension of me right?… That makes me feel a little better. I couldn’t be more proud of him. He truly has a servant’s heart and I Love him more each day because of it. My parents were able to keep our baby girl one night so hubby and I could go gut his parent’s house for our “date night”. Sounds real romantic right? Oddly enough, there was something romantic about working together to fix what the flood had broken. Going through a heartbreak together gives us the opportunity to heal together. The keyword being, together. In times of crisis and emotional turmoil be patient and honest with your spouse. Allow your broken hearts to heal together. You are one. Let this experience bring you closer and bind your hearts together in a way that would not be possible otherwise. You will end up with a stronger bond than before and you will see God’s goodness. 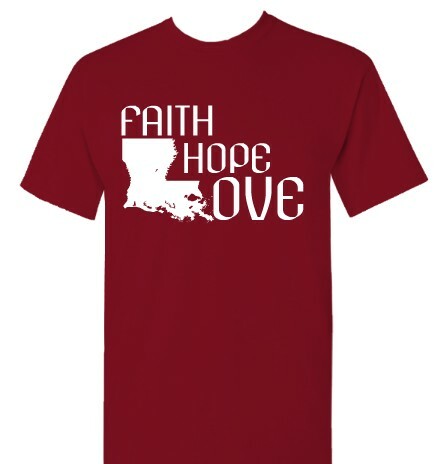 Even though this past week has been tough… our resolve here in Louisiana is tougher. I have been so encouraged and inspired by my friends during this time. I want to share with you what God is doing in their lives through this tragedy. God is already working things for their good and the studs aren’t even dry yet! He is faithful and He is in control.